infiniteZest.com: What happens when a custom control posts back? What happens when a custom control posts back? So, you are writing a custom control. And this custom control a two-way street -- meaning, you will be presenting something to the user and the user will be doing something with it or adding something to it that you need to capture. In addition, you might also implement a TextChanged event handler. Let’s see the order in which this post back handling mechanism executes. Following figure shows the order in which various post back handling methods execute. The user has, for example, clicked some button on the page or on the control that makes the page to be posted back to the server. The server infrastructure recognizes that this particular control wants to handle its data that has been posted back. The LoadPostData method has a bool return type. You want this method to return false, if your control state has not been changed. For example, if your custom control lets the user edit some text and no text has been changed between this and the previous postback, you would want to return false. If your control state has been changed (for example, the user has changed the text), then you want to return true. If this method returns false, then there is nothing else to do. The execution will go back to the page containing this control. However, if the return value is true (i.e. 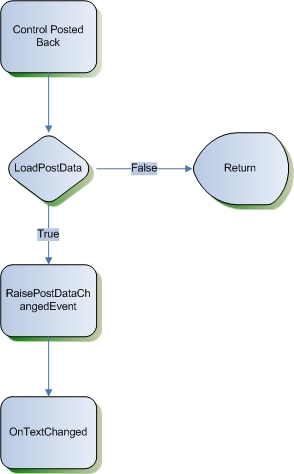 the control state has been changed), then the RaisePostDataChangedEvent() method will get called. From here, you can execute the OnTextChanged method. In that local delegate method, you can do whatever you want (with the information that the text in the custom control has changed). For example, here, we might want to save that changed text to the database. /// The text has changed. // Save the text to the database.